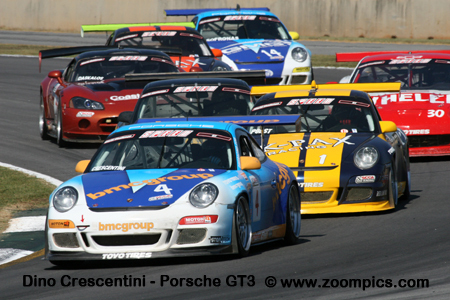 In 2008, the Sports Car Club of America’s (SCCA) World Challenge series was in its 19th-season. The SCCA had developed a successful format that attracted competitors and fans. Touring Car (TC) – The Touring Cars were limited to an engine displacement of 2.8-liters. Vehicles originally equipped with turbocharged or supercharged motors were also homologated for the series. The class was split predominantly between front wheel drive cars produced by Acura, Honda, and Mazda and the rear wheel drives such as the BMW 325i. There were twelve-race weekends during the 2008 season – ten races for each category. The Touring cars did not compete at Long Beach, Belle Isle or New Jersey. However, they raced at Virginia International Raceway and twice at Lime Rock Park. As in 2007, the opening round was held in March at Sebring, Florida. 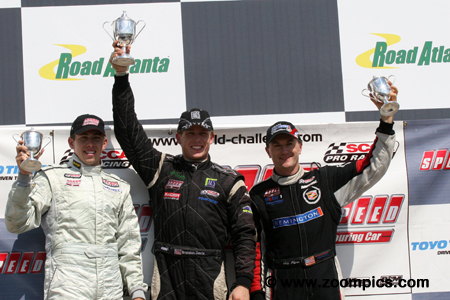 The championship ended in early October at Road Atlanta. 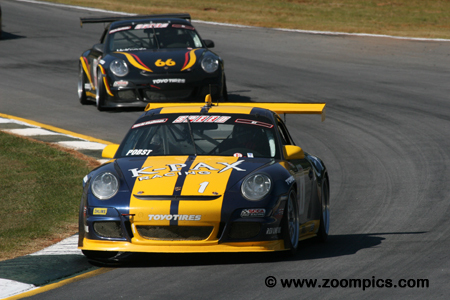 The final round of the 2008 World Challenge season was held at Road Atlanta. Drivers would compete on the twelve-turn 2.58-miles road course for twenty-eight laps or fifty minutes – whichever came first. 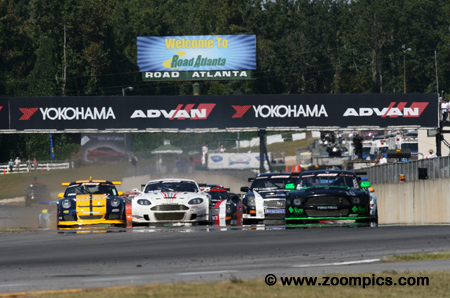 Twenty-six World Challenge Grand Touring competitors charge into Road Atlanta’s first corner for the season’s final event. Leading the field is the second fastest qualifier, Brandon Davis in the No. 10 Ford Mustang Cobra. A poor launch by the pole-sitter, Tommy Milner almost allowed third and fifth fastest starters, Andy Pilgrim and Randy Pobst to pass him before turn one. Brandon Davis started on the outside of the front row with pole-sitter, Tommy Milner. When Milner got a bad launch, Davis was able to put the ACS/Sun Microsystems Ford Mustang Cobra into the lead. He never looked back and led all twenty-eight laps – flag-to-flag - and won by a margin of 4.093-seconds. This was Davis’ second victory of the season – his first coming earlier in the year at Long Beach. The No. 21 Aston Martin DB9 was driven by Tommy Milner. Milner entered the series mid-season and made his presence known immediately with a fourth place finish at Mid-Ohio. 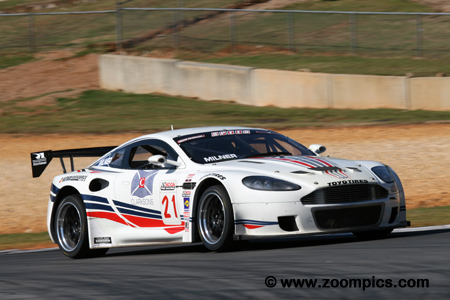 In the finale at Road Atlanta, he put the Aston Martin on the pole. At the start, Milner lost his advantage when he spun the tires. He followed eventual winner Brandon Davis to the checkered flag. The runner-up spot was his best result of the year. Michael McCann entered two Remington Shaving sponsored Cadillac CTS-Vs. One was raced by McCann and the second Cadillac, No. 8 was driven by the 2005 World Challenge Grand Touring champion, Andy Pilgrim. Pilgrim started in the third grid position and had a race long battle with the Chevrolet Corvette of Eric Curran. He was able to hold off Curran and grab the final spot on the podium. It wasn’t a particularly noteworthy race for Randy Pobst but he did what was required to win the 2008 World Challenge GT Drivers’ Championship. Pobst needed to finish twenty-sixth or better to secure his second straight GT title. In qualifying, he recorded the fifth quickest time driving the No. 1 K-PAX Racing Porsche 911 GT3. Pobst ran a steady ran a steady race - kept out of trouble and was in fifth place at the checkered flag. 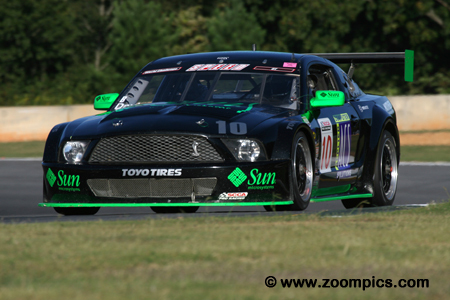 Foster Motorsports entered two cars at Road Atlanta. 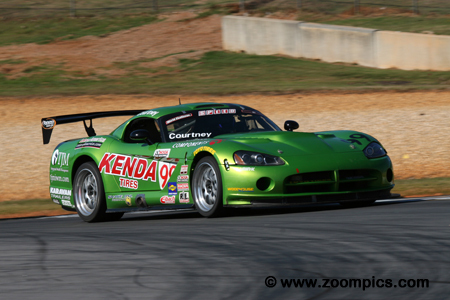 A Dodge Viper for Jason Foster and the No. 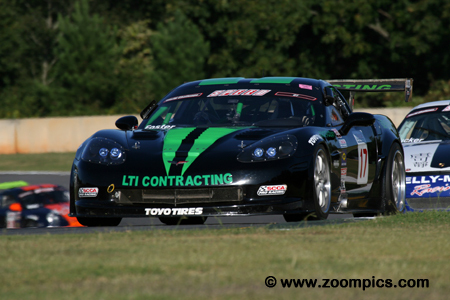 17 Chevrolet Corvette was driven by Rob Foster. Rob Foster qualified the Corvette twentieth in the twenty-seven car field. During the contest, he made great progress and moved up the race order to finish in twelfth place. Foster’s performance earned him the ‘Sunoco Hard Charger Award’ for advancing eight positions. Jeff Courtney driving the No. 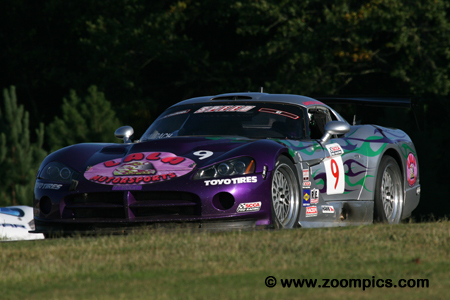 99 Dodge Viper had his best result of the season in the penultimate round at New Jersey Motorsports Park – qualified seventh and finished sixth. At Road Atlanta, Courtney started from the seventeenth position on the grid. Unfortunately for him, his race only lasted eight laps when he was involved in an accident. However, Courtney captured the ‘Racing Electronics Holeshot Award’ for advancing three positions on the opening lap. By simply starting the series finale, Gunter Schaldach took the 2008 Rookie of the Year title. Schaldach’s big advantage during the year was that he entered all but two of the season’s ten races. 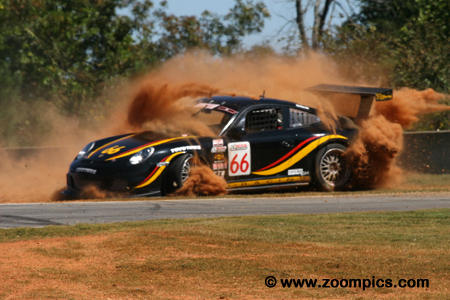 At Road Atlanta, he started sixteenth in the Lala Motorsports Dodge Viper and lost a position to finish seventeenth. In the final points tally, he had fifty-seven more points than Rookie contender, Stu Frederick. During practice, Tim Mackenzie had a moment in corner three. The car did not suffer any serious damage and was ready for qualifying and the race. Mackenzie qualified the No. 66 TR Racing Porsche 911 GT3 ninth and was eighth at the checkered flag. In seven events during the 2008 season, these were his best results. The 2008 season’s final World Challenge Grand Touring podium. In the center is ACS/Sun Microsystems’ Brandon Davis who earned his second victory of the year. To Davis’ right is Tommy Milner who captured the runner-up spot – his best results to date. Completing the podium is the driver of the No. 8 Remington Shaving Cadillac CTS-V, Andy Pilgrim.